NOTE (Added 9/29/2018): TO USE THIS TIP YOU MUST LOG IN TO GMAIL USING CHROME. This tip does not work in Firefox, Edge, Internet Explorer, or Opera. We have not tested it with Vivaldi or Chromium. If you have tested it in either of those browsers, please leave a comment. A few months ago Gmail announced the new Gmail with a new interface. But if you’re a fan of the classic (or old) Gmail, no problem. Google has done something many companies don’t do much anymore and that’s give you a choice. If you don’t like the new Gmail, you can easily switch back to classic Gmail – or the “old Gmail” as we call it. Whether you like the new Gmail or the classic (old) Gmail, it’s easy to switch back and forth. This tip is to remind you that you can switch back and forth and we show you how. 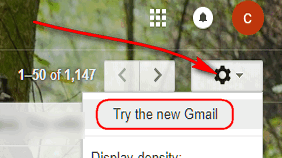 Sign into Gmail (using Chrome) and click on the Settings icon (it looks like a gear). 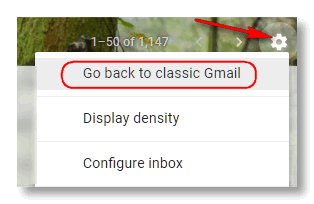 If you’re using the new gmail, click on “Go back to classic Gmail” and Gmail will quickly switch back to its old look. 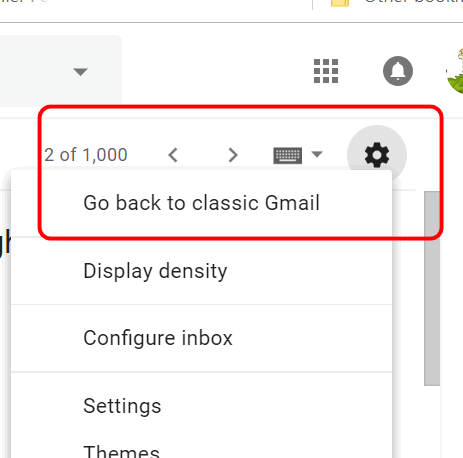 If you’re using classic Gmail and want to try the new Gmail, click on the Settings icon, and click on “Try the new Gmail”and Gmail will switch to the new look. You can switch back and forth as much as you like without affecting your email messages. New gmail or classic Gmail: Which do you like best? So glad we can switch back to the old version. I could not find any Trash in the new Gmail and I couldn’t delete my Trash. It’s there in the old version. That’s why I switched back to classic. They forgot to tell you that Gmail will soon be switching all Gmail users to the new version. Like it or not. You will then not be able to go back to the old version. So you might as well get used to the new version now. Not true, Larry. As of right now there is no word from Google on if or when they’ll remove the option to switch between new Gmail and classic Gmail. You must be referring to the announcement from Google about G-Suite users (not ordinary Gmail users). G-Suite is Google’s cloud for enterprise. Google will force-migrate G Suite users to the new Gmail in October 2018 with no way to opt-out. … all G Suite users will be forced to migrate to the new Gmail. There’s been no word from Google on when or if any of these changes will apply to regular users of Gmail. I had to reboot today and when I started Gmail there is no option to switch back to classic. I would really like to switch back to classic. Rebooting your computer has no affect on the Internet or Gmail. The option to go back to Classic Gmail / New Gmail option is still there if you click the right icon (the gear icon). Not true. I have clicked the Settings (the gear) and there is absolutely no option to switch back to classic gmail. I have also searched around extensively and have still found no option to switch back. Is there a way to contact Gmail to make a complaint and/or request for a classic Gmail option? While the post mentioned “log in to Gmail with Chrome” – I have now added it to the top of the post so no one misses it. If you follow the instructions in the post the setting is there. You have to log into Gmail using Chrome. You can’t use Firefox, Edge, Opera, or Internet Explorer. I have not tried it with Chromium or Vivaldi. There are millions of complaints about this, I don’t see Gmail changing their minds. It’s far easier for you open Gmail in Chrome, and change to Classic view. But Classic Gmail is not going to be around forever. I switched back, immediately, as well. I did not like that “new” version at all. So glad they let us keep the old..I like keeping what we get used to using..
> remove the option to switch between new Gmail and classic Gmail. Out of interest, where would you personally have gotten that word from an authority high enough at Google to declare another poster’s comment “not true” in this? The option to go back to Classic Gmail is still available (as of 9/29/2018) if you log into Gmail using Chrome. I have the current version of Chrome and verified it this morning. I have several Gmail accounts – it works on all of them for me. But the option is not there on any browser other than Chrome. As far as link you posted, I don’t see any official word from Google there. I skimmed it so I might have missed it. However there is no doubt that unless things change, Classic Gmail is not going to be around much longer. Hi Bill, if your account does not show the “go back to classic gmail” option, there’s no way back. Google is phasing it out – so some accounts (mine for instance) still show the option while others do not. Once it’s gone (classic) it’s gone… sorry to say.